More campuses are rethinking the best use of existing space to bring facilities resources in line with emerging program and workforce needs. Dynamic, active, shared. That’s one way to sum up current shifts in campus space management, says Elliot Felix, founder and CEO, brightspot strategy LLC, New York City. On the rise: developing spaces that you can more easily adapt as needs change, that create a sense of energy to attract people, and that serve multiple functions to maximize convenience and cost efficiency. “Some institutions reshape their space based on a strategy, but for many it hinges on what spaces are easiest to measure,” says Felix. That’s why classrooms most often come under scrutiny. Occupancy data are typically readily available as a snapshot of underutilized or maxed-out spaces. Yet, classroom space for most institutions often consumes significantly less total square footage as compared to faculty and administration work spaces, where usage is more difficult to quantify. Clear trends have emerged surrounding space use, but each campus must assess what constitutes the best use of space based on its unique circumstances and priorities. The profiles that follow provide a glimpse of specific campus scenarios for space-related decision making. 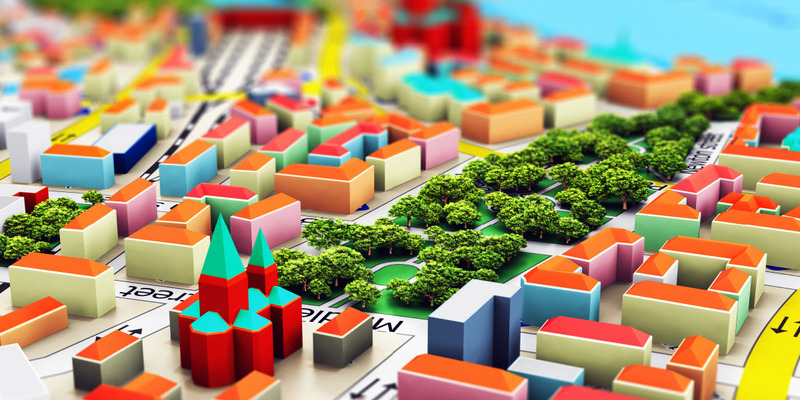 “A plan doesn’t have to hem you in, but not having a plan limits your flexibility for getting where you need to go with campus infrastructure,” says Phil Moessner, assistant vice president of facilities management, St. Cloud State University (SCSU), St. Cloud, Minn. The key is having a good plan. Indeed, the comprehensive facilities plan developed by SCSU in 2015 has lived through multiple transitions in top leadership—including president, provost, and CBO—with only minor tweaking. Those leader transitions include Tammy McGee, formerly SCSU vice president for finance and administration, and now chief financial officer at Dunwoody College of Technology, Minneapolis. McGee oversaw efforts to flesh out the road map detailing the condition of each building across campus. St. 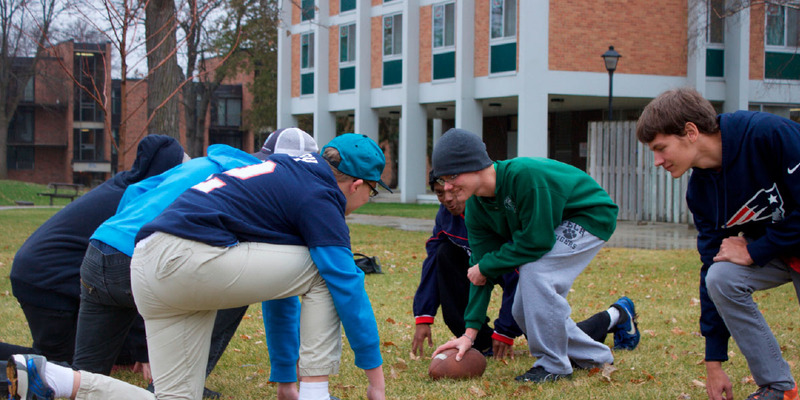 Cloud State University students enjoy the fall weather with a friendly football pickup game on the grassy field where Holes Hall once stood. In addition to organized events on the green, both on-campus and local neighborhood students use the open space for recreation. In the background, the previously mothballed Stearns Hall—built in 1966 as a twin to Holes—is near capacity, housing 166 students out of a total 172 available beds. In its current configuration, many of the rooms are set up as singles under the “Simply Stearns” concept, offering a scaled-back, low-cost, low-amenity option to students. Check your reality. The primary catalyst for SCSU’s comprehensive facilities plan was a recognizable shift in student enrollment largely correlating with statewide and regional demographic changes. Multiple years of significant growth in the past led to nearly 500,000 square feet of facilities space added since 2000. In more recent years, steady declines and a leveling off of the student population to its current 14,000-plus levels have left leaders of this comprehensive university with the challenge of figuring out how to maintain a financially sustainable physical plant footprint while also reconsidering the need for this extra square footage. “We had to build a plan that specifically named rightsizing and downsizing of campus buildings and property as a strategic priority,” says McGee. Downsizing has included selling land, including one parcel about 50 miles from the main campus that had been donated to the university years back when SCSU leadership envisioned expansion into a different academic direction that did not ultimately emerge. “Through our planning process, we determined that continuing to hold on to these excess properties was not good stewardship and was keeping us from investing in other priorities such as classroom innovation,” says McGee. Rightsize. Another priority driving SCSU’s facilities plan is improving the residential experience of students. Surrounded by a river and private homes, SCSU’s campus is compact and dense, and was lacking informal recreation space, says McGee. The decision to demolish one of the older residence halls that was no longer needed allowed for some much-needed green space. “Demolishing the hall was one of those pivotal moments for our institution,” says Daniel Gregory, interim provost. “Prior to that, the thinking was that you would never want to remove built space.” Yet, having previously gone through a significant academic reorganization, in which some programs were closed and some added, helped set the stage for the community to think more critically about institutional priorities, says Gregory. “That doesn’t necessarily make the discussions easier,” he says. “Key to implementing our plan has been a facilities director who can point to the plan, explain the data behind the plan, and have those sometimes difficult conversations about what it means for space to go away or for the need to change spaces, and why certain decisions are in the best interest of the institution or students,” says Gregory. Factor in flexibility. The university is now midway through its first five-year phase of its 20-year outlook aimed at improving space use. Even as the university recalibrates its physical space to match current needs, plans are underway to develop a new learning commons that will centralize student services and include space for evening and weekend programs, among other activities, to bring more buzz to the campus. Show stewardship. Because of the condition of some campus facilities across the sector, we need bold leadership from business officers and other senior leaders to think about how best to use our assets, says McGee. “One area where you can add real value as a business officer is in showing good stewardship of facilities assets.” Too often, the politics of space can get in the way of doing that, she adds. St. 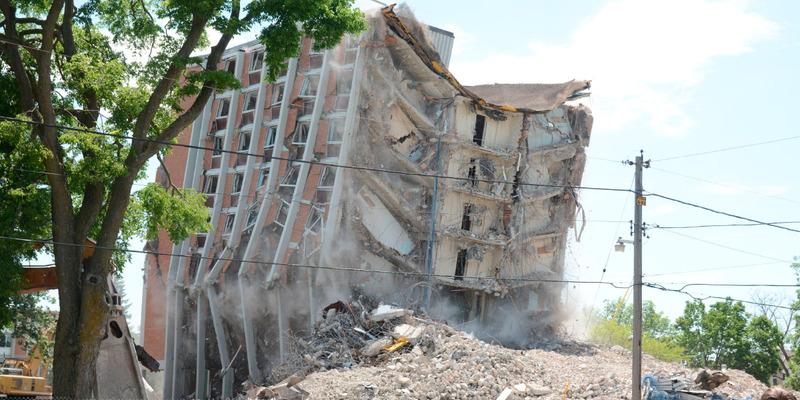 Cloud State University’s Holes Hall—a nine-story, 80,000-square-foot residence hall built in 1965—was demolished in June 2016 due to excess ca-pacity and a high deferred-maintenance backlog. During the past decade, enrollment at Centre College, Danville, Ky., has grown by 30 percent to its current 1,430 full-time students. For a campus that is 98 percent residential, that steady squeeze on living space and seating capacity in the college’s central dining commons was exacerbated by finding office space for new faculty and staff hires. According to Brian Hutzley, Centre College’s chief financial officer, vice president, and treasurer, the short-term reflex was to acquire houses adjacent to the campus periphery for student housing, as well as to transition some office spaces into beds. “In the process, we ended up having to split some departments between buildings, which in turn introduced some friction among those vying for space.” To better address these and other emergent issues, the college convened a space committee to work collaboratively on campus space solutions, says Patrick Noltemeyer, chief planning officer and special assistant to the president. Layer comparisons. Increasingly cramped quarters was the primary driver behind the 2017 launch of a six-month comprehensive master planning effort. This included dozens of meetings and open sessions to solicit input from every occupant group on campus and to compile user data on classrooms, meeting rooms, and office space. The comprehensive assessment has gone way beyond space use, overlaying those findings with an updated energy master plan and factoring in priorities related to deferred maintenance, ADA compliance, landscaping, and even signage for the 200-year-old campus. “As we move forward with any upgrade or expansion, maximizing energy efficiency is a top priority,” Hutzley says. As part of overall planning, the college commissioned an engineering review of all lighting and HVAC systems. That essential to-do list will inform the college’s operating budgets and capital requests as the campus works its way through its space retrofit. One thing at a time. The challenge for a small, highly residential institution such as Centre College may be finding enough flex space to allow for renovations, says Noltemeyer. “In our case, we were already so tightly packed that we couldn’t afford to take anything offline. That meant trying to free up space around the edges or to renovate one floor at a time.” One short-term project did add three classrooms to help accommodate more sections of those courses in highest demand so that the college could maintain smaller class sizes. Currently, 61 percent of classes have a size of less than 20 students, says Noltemeyer. The new master plan calls for addressing space needs through a combination of renovation and new construction. First up is a new residence hall, scheduled for completion in August 2019, that will not only add 180 new beds, but will also provide that much-needed swing space in advance of renovating and expanding existing spaces. It will also help the college reclaim some of the former office spaces it had converted to student housing for the short term, says Noltemeyer. The new residence hall will also account for almost 20 percent of the projected $100-million master plan, says Hutzley. The vast majority of the remaining funds will be devoted to renovation and expansion of existing space. Within that category, priorities include the college’s science complex, and campus center and dining commons, which will gain some sorely needed kitchen capacity. In addition to normal campus operating funds allocated for upgrades and minor renovations, the college’s board has approved $30 million in debt financing. It is looking to third-party grant funding and donor pledges to help accomplish other space expansion and retrofits. The planning process also helped identify some underlying needs, says Noltemeyer. “As we renovate and expand, we plan to introduce more informal study spaces in every building on campus, including every nook and cranny where we could place a couch and tables.” The suggestion from students to open the cafeteria for additional evening study space has already been implemented. “Under normal operations, the space was cleaned and doors closed by 8 p.m. We worked with our food provider to reopen the space after hours.” Now, dining facility staff lightly touch up the space before reopening for breakfast, adds Noltemeyer. In 2014, the University of Wisconsin System faced criticism from some state legislators about the need for new construction amid declining enrollments. This led to discussions at the University of Wisconsin System regarding space-related policies that were needed to impose a stricter rationale for campuses to request new space, says Alex Roe, the system’s associate vice president for capital planning and budget. Fast forward and the system’s “no new net square footage” policy implemented in 2015 outlines the eligibility threshold criteria for institutions requesting new space: The facility will generate revenue; the cost to upgrade or fix an obsolete structure is more than 75 percent of the cost to build new; the current structure has serious code violations; or the structure will serve a new or growing academic program priority. Focus. The criteria have forced campus leaders to be more intentional about the kinds of spaces they most need. “We’re also seeing more robust feasibility studies coming from our campuses as leaders take a more stringent look at ROI and the cost to renovate versus cost of a new structure,” Roe says. One challenge in Wisconsin, as is the case for many systems of higher education, is that a big chunk of the university system’s inventory—probably 50 to 60 percent—was built between 1950 and 1975. That means a lot of aging infrastructure with lots of inflexible building materials and poor energy efficiency standards. Midcentury science buildings in particular—of which there are many post-WWII GI Bill-era structures that popped up—are extremely difficult to renovate to modern HVAC requirements, says Roe. “In our current budget, we received at least three science building requests that are under review.” As the sciences continue to become more integrated with other disciplines, this will certainly have an impact on space going forward, says Roe. “The truth is that many campuses have enough buildings that meet that historic iconic alumni mug criterion,” she says. While these are most often very expensive to maintain, a campus isn’t going to tear them down. The more sustainable approach to meeting future space needs is to consider constructing a 30-year building instead of a 100-year building, when you don’t know what instruction is going to require several decades from now, suggests Roe. Optimize. Campuses are self-identifying underutilized space and considering new approaches to optimize use. For instance, most campuses across the system are essentially flat on residential space. “Our approach there is to renovate existing space and not add new beds,” says Roe. Several campuses with a housing surplus are looking to partner with other local colleges to offer housing to their students who might want an on-campus living experience. Roe’s advice to CBOs when confronted with requests for new space: Start by asking what is core to mission? Can programs share space? Get leaders to consider multiple ways to get what you need other than a new building. From his direct work with and observations of higher education institutions, Elliot Felix, founder and CEO of brightspot strategy LLC, New York City, identifies several current trends in campus space management. Student-centric. “In the end, it’s all about the students,” says Felix. Classrooms on many campuses are already being redesigned for active and collaborative learning. Perhaps a bigger strain is finding and retrofitting space for the marked uptick in student services that have emerged over the past decade. More institutions have responded by creating one-stop shops, but that in itself can create a spacing crunch, notes Felix. One institution client he worked with consolidated student services functions spread across 13 buildings to three hubs. “Renovations were required, but the process will also free up space to reallocate to other priorities,” Felix says. Porous. For more colleges and universities, campus borders are becoming more permeable as institutions invite collaboration with outside entities through development of innovation labs, incubators, and training facilities, as well as shared-research campuses and innovation districts. Convenient. The move to transform spaces in order to better support student experiences should include common areas. “No administrator wants to see students sprawled on the floor in the corridors because those are the only available outlets to plug into,” says Felix. When thinking about reshaping public spaces, much can be learned from the hospitality industry. “In many instances, hotel lobbies have transitioned from empty spaces you move through to a place you want to stop in and enjoy. They have comfortable seating to sit and work or to meet people, with the colocation of food service and with conference rooms for private meetings.” These same spaces can be also converted to an event space. Multipurpose. Libraries are enjoying a renaissance in which campuses are incorporating new kinds of learning and research, transitioning from places to access information to places where information is also created and shared. “There is no reason to not locate your writing center or math support lab within your library or to include group study rooms,” Felix says. Consider how some pharmacies have reinvented. Instead of mere transactional places where you go to drop off or pick up a prescription, now you can also get a flu shot, get your blood pressure checked, or meet with a nurse practitioner for a checkup. That same kind of expanded mission for colocating and showcasing a set of popular student services could be true for campus libraries as well.